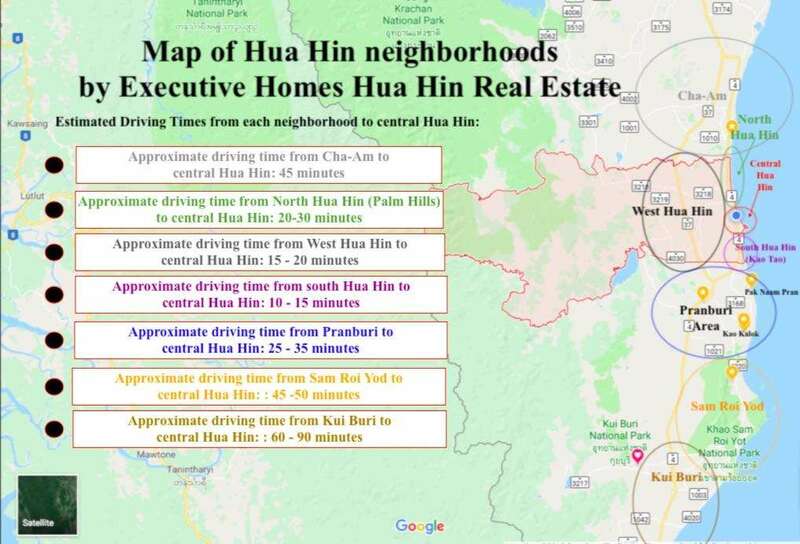 If you have made the decision to move to the Hua Hin area and are doing some preliminary research on where to buy Hua Hin property, you may be feeling overwhelmed with the vast real estate choices within and surrounding Hua Hin. We would like to make your selection easier by providing a description of the various areas within and around Hua Hin for you to make a more informed decision on where you would like to live. Option 1: Hua Hin Beachfront Properties Most people who move to a beach town have the idea that they would like to be close to (or directly on!) the beach (we certainly had this intention prior to moving to Hua Hin!). And most people also assume that Thailand is cheap and therefore the real estate market in Thailand should likewise be cheap. Sadly, this is not the case in Hua Hin; nor most beach towns throughout Thailand. The beach front areas within Hua Hin town have increased in price dramatically over the past few years, making it virtually impossible to purchase raw land along the beach, either because there are no more large plots available or because the price is so prohibitively expensive (to the average buyer) that it probably wouldn’t make sense to buy this land for a single family home. The only viable option for living along the beach in Hua Hin town on a moderate budget is to purchase a condominium unit. There are many very nice condo options that are reasonably priced from about 4 M THB – 8 M THB for 1-2 bedroom units. Granted, considering the increase in land price along the Hua Hin beach, the size of these units has consistently decreased over the past few years. In our opinion, your best value for a condominium purchase would be to find an older, well-maintained development whose units are larger and whose common areas are more spacious. One of our favourite developments in Hua Hin is Baan San Saran: the common area gardens and 2 pools are gorgeous, impeccably maintained and much larger than you would find in any of the newer condo developments within Hua Hin town centre. Another development we like is in Kao Takieb, just a few km from Hua Hin town centre, and this 2 bedroom, 2 bathroom Kao Takieb Condo unit is very spacious and has a lovely sea view and direct beach access. Another option for people who absolutely must live absolutely on the beach is to expand the parameters of distance to Hua Hin town centre. There are some very nice condo developments in Kao Tao, about 10 km south of Hua Hin town centre, and many developers have focused their attention on this area, as land is still relatively less expensive here than in Hua Hin and Kao Takieb. We have some very nice units for sale and for rent at Malibu, Chelona, Baan Nub Kluen, Santipura and other developments in Kao Tao. In our humble opinion, the beach is also nicer down along this area, so there’s a double benefit! Option 3: West Hua Hin Over the past few years, more and more developers began building West of Hua Hin, again because the land prices were so much more affordable at that time (that has since changed, and land prices in West Hua Hin are now increasing due to all the development). There are still many developments in West/Southwest Hua Hin with both off-plan (new build) and re-sale options available, and here are a few that we recommend: Orchid Palm Homes, Mali Homes by Orchid Palm Homes, and Prestige by Orchid Palm Homes, The Views ; Orchid Palm Homes, The Residence; and Orchid Palm Homes 3, 4, 5. Another very nice development is Red Mountain, Red Mountain Boutique and Red Mountain’s newest development, The Woodlands by Red Mountain. Additionally, there are a few other notable developments in this general area, such as Baan Phu Thara, Avenue 88, The Lees, Hillside Hamlet. All of these developments are located West of Hua Hin town centre by about 10-15 minutes. The benefit of purchasing a home in this area is that the land prices are still less expensive than in central Hua Hin, so you can have a home with more land (i.e. 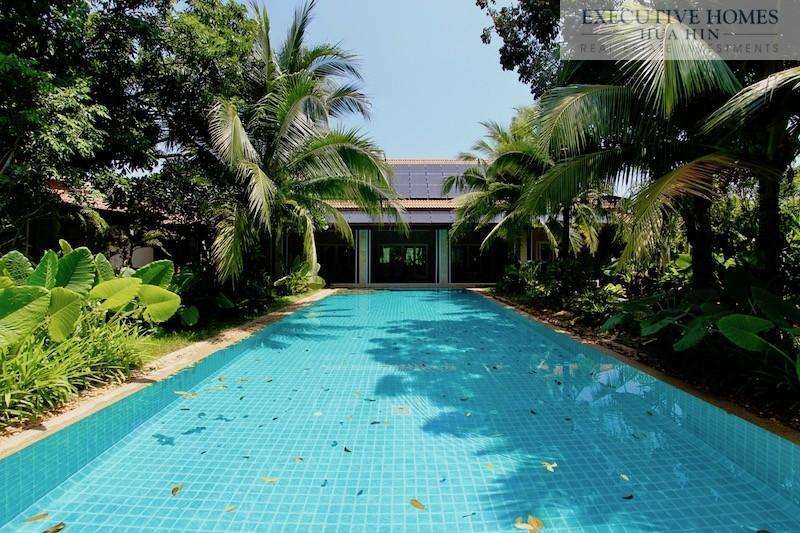 larger living space, larger garden and larger pool areas) for the same price or less than in Central Hua Hin. Another benefit is that the bypass road is nearby, thus making a commute to and from Bangkok more convenient and efficient, saving up to 30 minutes’ driving time. Some people complain that the beach is far away, but at approximately 8-10 km, it’s only about a 10-15 minute drive to Hua Hin town centre and to the beach. Another drawback for some clients is that the infrastructure hasn’t really caught up with all the development yet, and besides the plethora of housing developments, there’s not a lot in the way of shops, restaurants, entertainment, etc., though this is slowly changing. Not far from this area and slightly further north is Black Mountain Golf Course, one of the most beautiful, most technical, and highly praised golf courses in Hua Hin and throughout Thailand. There are a couple housing projects near Black Mountain, but the most notable is Baan Ing Phu, a luxury housing complex with the concept of creating a community and an entire lifestyle based on health, wellness and outdoor activities. Within the development, there is a wellness spa; an organic restaurant (healthy and delicious food! ); a fitness centre with personal trainer, yoga and Muay Thai classes; tennis courts; and spacious green areas for residents to enjoy. These are some of the best quality homes throughout the greater Hua Hin area, though that quality comes at a steep price tag: they are also some of the most expensive villas as far as price per square meter goes. The homes are all completely custom built, and the architect will work with you personally to design the home of your dreams. The majority of the homes tend toward more modern designs, though you have the choice to design your villa in any style you prefer. Option 4: South (Kao Tao, Pranburi, Pak Nam Pran, Kao Kalok, Dolphin Bay) Many people are looking further south in areas like Kao Tao (about 10 km south of Hua Hin centre) and Pak Nam Pran and Kao Kalok, both in Pranburi. For some, the attraction is the reduced cost of living. These areas are still more affordable than Hua Hin, especially the further south you travel. The prices of land and homes tend to be less than in Hua Hin, but also the daily cost of living is much less. Food and entertainment are slightly less expensive in Pranburi than in Hua Hin, which is a big plus for those on a modest, fixed income. Additionally, these areas have the huge advantage of being much closer to the beach than properties in Hua Hin. The natural beauty in these areas is still more pristine and less developed than in Hua Hin, and there is far less traffic the further south you head within Prachuap Khiri Khan province. There is also a hip, artistic, bohemian vibe in Pranburi, which appeals to those looking for a more natural, authentic and laid back atmosphere. There are cool, funky bars, restaurants and resorts in the area, and most of the kiteboarding in the region has centralised here. Check out Golden Sands Beachside Villas here.